My good friend Tim and I wanted to meet up for a holiday season beverage before taking off for the rest of the year. Tim commutes in from South Jersey so he suggested I pick a location near Penn Station. Having taken Tim on a Burger Conquest to J.G. Melon before, I knew where we had to go; Brother Jimmy’s. The popular BBQ and wing spot, Brother Jimmy’s opened their 4th location in Midtown back in 2007 and have been serving up commuters, concert goers, sports fans and Midtowners ever since. The menu here is almost exactly the same as their original Upper East Side location with two small exceptions. A. Everything is more expensive and B. the addition of “Mini’s” from their Brother Jimmy’s Burger Shack location next door. Brother Jimmy’s offers beef, turkey or fried buffalo chicken sliders. I asked for a mix-n-match of 1 of each but the friendly waitress told me they only come in 3’s so beef it was! Kudos to Brother Jimmy’s for serving them on mini potato rolls. 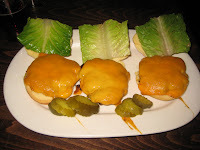 The little burgers each are completely covered in a slice of cheddar and with a perfectly cut squared lettuce leaf. I flipped my patties so cheese was on the bottom and bit in. Due to their small size, the patties are cooked well done but it doesn’t keep them from remaining juicy. I did try a little bit of the BBQ mustard on one of my mini’s and although a fan of the sauce, it didn’t work on the burger. Thank god I still had one left! 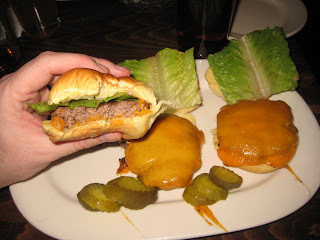 The mini’s were a great bar snack and have me curious to try the full burger at the shack. 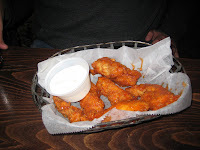 In the no man’s land of food that is midtown, Brother Jimmy’s offers great atmosphere, convenient location and tasty mini’s and good wings. 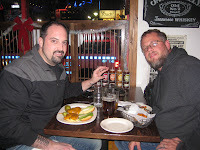 This entry was posted in Burgers, Hot Wings and tagged bar, best burger, best burgers in nyc, Brother Jimmy's BBQ, burger blog, burger club, burger conquest, cheese, ciancio, david, french fries, gourmet burger, great burger, hamburger, Hot Wings, mini burgers, nyc, restaurant, rev, review, wings. Bookmark the permalink.